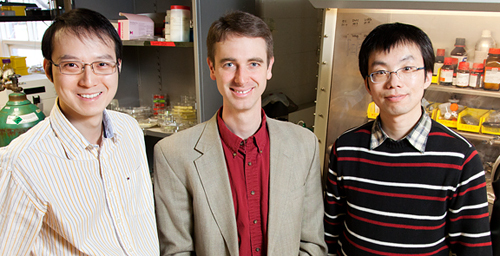 Paul Braun, professor of materials science and engineering, center, led the research group of graduate student Xindi Yu, left, and postdoctoral researcher Huigang Zhang that developed a three-dimensional nanostructure for battery cathodes that allows for dramatically faster charging and discharging without sacrificing energy storage capacity. CHAMPAIGN, Ill. - The batteries in Illinois professor Paul Braun's lab look like any others, but they pack a surprise inside. Braun's group developed a three-dimensional nanostructure for battery cathodes that allows for dramatically faster charging and discharging without sacrificing energy storage capacity. The researchers' findings will be published in the March 20 advance online edition of the journal Nature Nanotechnology. Aside from quick-charge consumer electronics, batteries that can store a lot of energy, release it fast and recharge quickly are desirable for electric vehicles, medical devices, lasers and military applications. "This system that we have gives you capacitor-like power with battery-like energy," said Braun, a professor of materials science and engineering. "Most capacitors store very little energy. They can release it very fast, but they can't hold much. Most batteries store a reasonably large amount of energy, but they can't provide or receive energy rapidly. This does both." The performance of typical lithium-ion (Li-ion) or nickel metal hydride (NiMH) rechargeable batteries degrades significantly when they are rapidly charged or discharged. Making the active material in the battery a thin film allows for very fast charging and discharging, but reduces the capacity to nearly zero because the active material lacks volume to store energy. Braun's group wraps a thin film into a three-dimensional structure, achieving both high active volume (high capacity) and large current. They have demonstrated battery electrodes that can charge or discharge in a few seconds, 10 to 100 times faster than equivalent bulk electrodes, yet can perform normally in existing devices. This kind of performance could lead to phones that charge in seconds or laptops that charge in minutes, as well as high-power lasers and defibrillators that don't need time to power up before or between pulses. Braun is particularly optimistic for the batteries' potential in electric vehicles. Battery life and recharging time are major limitations of electric vehicles. Long-distance road trips can be their own form of start-and-stop driving if the battery only lasts for 100 miles and then requires an hour to recharge. "If you had the ability to charge rapidly, instead of taking hours to charge the vehicle you could potentially have vehicles that would charge in similar times as needed to refuel a car with gasoline," Braun said. "If you had five-minute charge capability, you would think of this the same way you do an internal combustion engine. You would just pull up to a charging station and fill up." All of the processes the group used are also used at large scales in industry so the technique could be scaled up for manufacturing. The key to the group's novel 3-D structure is self-assembly. They begin by coating a surface with tiny spheres, packing them tightly together to form a lattice. Trying to create such a uniform lattice by other means is time-consuming and impractical, but the inexpensive spheres settle into place automatically. Then the researchers fill the space between and around the spheres with metal. The spheres are melted or dissolved, leaving a porous 3-D metal scaffolding, like a sponge. Then a process called electropolishing uniformly etches away the surface of the scaffold to enlarge the pores and make an open framework. Finally, the researchers coat the frame with a thin film of the active material. The result is a bicontinuous electrode structure with small interconnects, so the lithium ions can move rapidly; a thin-film active material, so the diffusion kinetics are rapid; and a metal framework with good electrical conductivity. The group demonstrated both NiMH and Li-ion batteries, but the structure is general, so any battery material that can be deposited on the metal frame could be used. "We like that it's very universal, so if someone comes up with a better battery chemistry, this concept applies," said Braun, who is also affiliated with the Materials Research Laboratory and the Beckman Institute for Advanced Science and Technology at Illinois. "This is not linked to one very specific kind of battery, but rather it's a new paradigm in thinking about a battery in three dimensions for enhancing properties." The U.S. Army Research Laboratory and the Department of Energy supported this work. Visiting scholar Huigang Zhang and former graduate student Xindi Yu were co-authors of the paper. Editor's note: To contact Paul V. Braun, call 217-244-7293; e-mail pbraun@illinois.edu. The paper, "Three-Dimensional Bicontinuous Ultrafast-Charge and -Discharge Bulk Battery Electrodes." is available online.